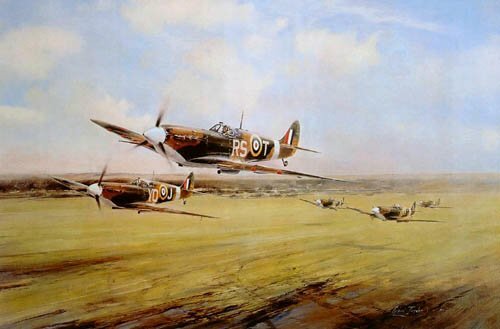 Overall print size: 23" x 30"
Biggin Hill was one of the most active R.A.F. Fighter bases of World War II. Fighter aircraft scrambled as many as seven or eight times a day during the height of the Battle of Britain. Mark Vb Spitfires are seen retracting their undercarriage almost as soon as they leave the ground in order to gain height as quickly as possible. Each print is individually signed by the artist and one of the most 'natural' fighter pilots - Bob Stanford-Tuck.